That, and in my personal experience, an awful lot of luck. When some of the first government social safety nets emerged during the Great Depression in the mid-1930s, they were accompanied by volunteer and work requirements to ensure dignity, self-reliance and self-respect. With common roots in Chicago’s Hull House, the vaunted welfare program of The Church of Jesus Christ of Latter-Day Saints (Mormons) was launched in 1936 and is structured even today around a recipient volunteer program. 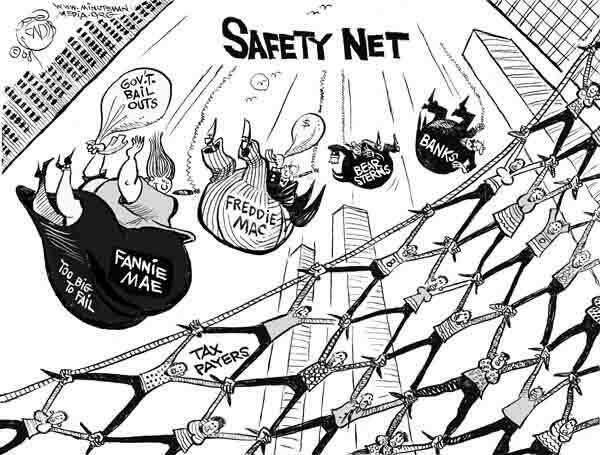 Who knows how much better safety net programs would be today if partisan hostility had not stripped funding out of the government programs that enabled associated oversight of conditional volunteer and “pay it forward” programs. The Mormon welfare program is as successful as it is because of the more than 870,000 of associated volunteer-days on welfare farms and in storehouses and distribution centers. Mormon officials report that individual recipients typically receive aid for three to six months while they volunteer, but my experience growing up in that culture tells me there is a small percentage of recipients, some multi-generational, who, just as is seen in government programs, never seem to be able to fully escape the vicious cycle of poverty described by Queenan. Entitlement is no more common among the poor than it is with people who are educated or middle class or rich or in parasitic, rent-seeking corporations such as billboard companies. A classic example appeared in a news story last week from Raleigh, which is near Durham, where I live. A person quoted in the story questioned, while noting she had a PhD, why she should have to refrain from interrupting her boss and I suspect other forms of social and business etiquette? It seems that both liberals and conservatives are too caught up in playing offense and defense over the condition of entitlement and other issues and have been for more than 20 years. While more willing to join moderates in compromise, liberals have been far too dismissive of concerns raised by economists and sociologists, both White and African-American, about the troubling by-products of safety net programs, many of which these experts helped devise. These included The Rediscovery of Character: Private Virtue and Public Policy by the late Dr. James Q. Wilson, The Moral Quandary of the Black Community by Dr. Glenn C. Lowry, now at Brown University or The Content of Our Character by Dr. Shelby Steele, now a senior fellow at Stanford University’s Hoover Institution, all penned between 1985 and 1990. Gridlock, primarily forced by conservatives, has made a more nimble and entrepreneurial approach impossible; although to his credit, President Obama has found ways to fuel program innovations anyway, often by end-running the bureaucratic process. Economic conservatives, having abandoned half of their “intellectual ammunition,” to paraphrase New York Times columnist David Brooks, have forgotten a founding principle of that movement that it is “best to reform steadily but cautiously” and turned instead to fiscal strangulation and a social mobility Dance of Death. As Thomson Reuters Digital editor Chrystia Freeland wrote in yesterday’s New York Times in an article entitled The Self Destruction of the 1 Percent, adapted from her book published last week entitled Plutocrats: The Rise of the New Global Super Rich and the Fall of Everyone Else, today’s conservatives seem to be following the playbook of Venetians at the turn of 13th century. And that didn’t turn out too well.